I bought all the green containers at Target. They are called Sterilite clipboxes. They come in different sizes, but mostly I used the medium ones. I bought the white baskets at the dollar store. While not perfect, there are several reasons this system works for us. We can see exactly how much have of our staple items we have at any moment, which makes adding to our shopping list very simple. Stackable containers makes it very easy to store items so they can be found easily. We lessen the sway of marketing because our son does not see brands and logos. Once my son started on solids, I got serious about cooking from scratch. 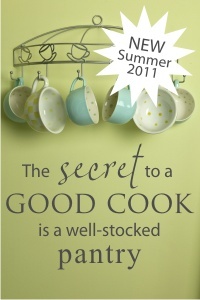 As I've become more comfortable in the kitchen, the more we've been able to reduce the number of processed items we eat. Now, we eat 95% of meals at home, and I make them myself. This means my kitchen wishlist is growing. When Niels and I started talking about building a home, my first priority was the kitchen and pantry. We've talked about the kitchen--and I'm sure we'll talk more!--and now it's time to explain the pantry. I knew I wanted a large, walk-in pantry, and because we wanted to have to stack two large spaces that could be used for a future elevator. if needed, we found room for my dream pantry, and I started browsing the web for inspiration. 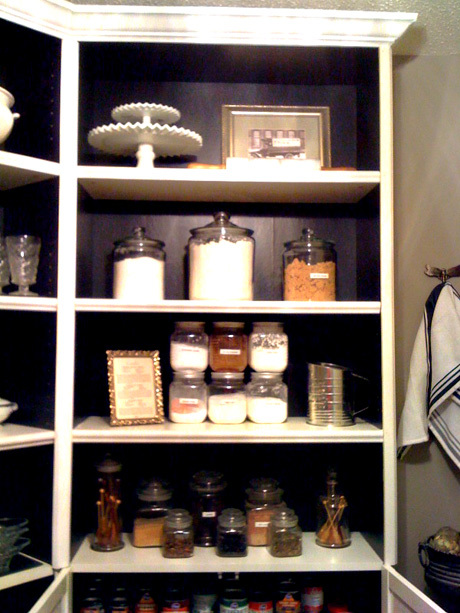 In addition to Houzz.com, I found a little gem of site called, aptly, The Perfect Pantry. 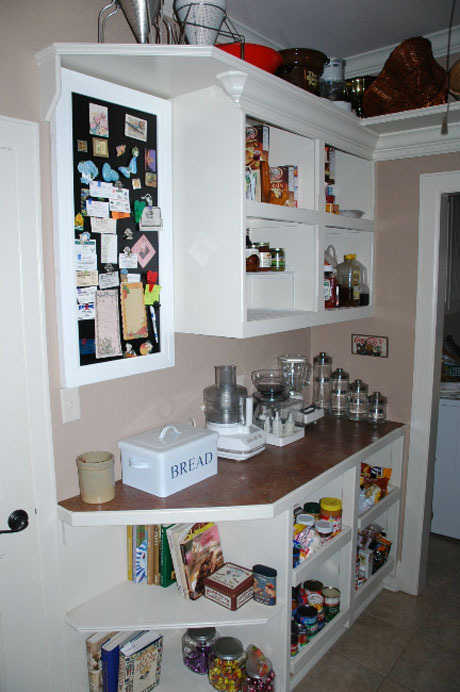 Among other things, the blogger has a every-other-week feature called "Other People's Pantries," where readers send in pictures and descriptions of their own pantries. 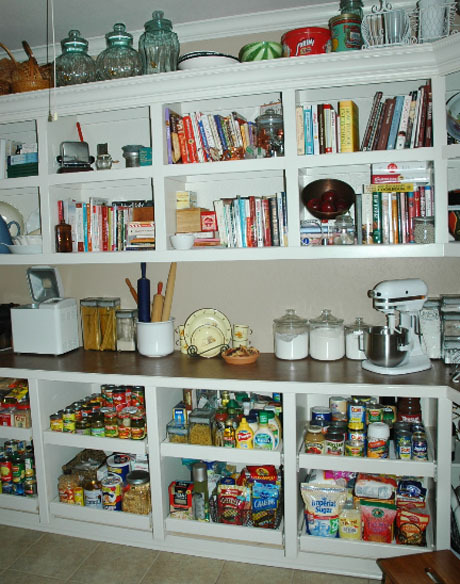 An older version of my pantry was featured as OPP #134. The site is just a fantastic way to get ideas of how to organize your pantry, big or small. I love all the space (of course! ), but I really fell in love with the idea of an appliance counter. Perfect for housing all the gadgets not used daily--toaster, coffee makers, food processor, etc.--so they are off the kitchen counter. It also creates a place to put grocery bags while putting items away each week. The upper cabinets are not as important to me, as I am only 5'4". The lower space is definitely more important to me. The second round of inspiration came from the one, which I believe is made of Ikea Billy shelves with the backs painted. This photo was originally in Family Circle magazine, but the link is dead, so I sourced this photo from Tart House. a little perspective. lots of room to store goodies for the neighborhood kids! We know that we will be upgrading to a standing freezer (anyone want to buy our chest freezer? ), which will make it easier to store extra staples as well as the portion of cow we're planning to buy from a local farm. Updated 08.16.13: Sadly, the Ikea Varde Counter Storage Unit has been discontinued. I love the butcher block. I LOVE all the drawers. I love the natural wood that goes with my natural book shelves. I love the steel accents. I really love it. There are several pieces in the Varde kitchen collection, so we can play around with sizes to figure out what fits. You can also buy just the butcher block, in a variety of sizes. Ikea Stenstorp Kitchen Cart. Not sure if I'd keep it white or paint it. Depends on what I did with the shelves. We'll be meeting with the carpenter in a few weeks to talk about the final design, but I've very happy to know that we have a lot of components to play around with to get started. The beauty of Ikea is that all these pieces are not assembled when you bring them home, so if it's easy/more cost-effective for the carpenter to use these items to make a unit that works and fits in my pantry, then we'll be done that much sooner. A fun splurge idea I found at Ikea was this pendant for only $29. I'm not sure if it'll provide enough light, but it sure is pretty! I've been having a lot of fun on Pinterest.com looking for ideas. 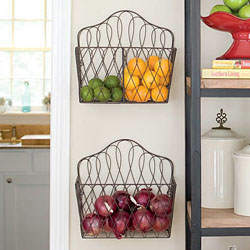 Two keepers are this DIY can rack made with upside down wire closet racks. French wire convertible baskets as sold by Willow House. Updated: the baskets are no longer available. Source photo from The Homestead Revival. Lastly, a door. 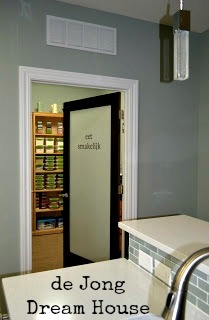 I like the look of a frosted door, like one of these two options, depending on whether or not we go for a full door or double door (the doorway is 36" for universal design). We are now moved in! My new pantry isn't totally done yet, but here's a first peek at how it looks one week post-move in. Our new pantry is organized. Wanna see? Fantastic! I wish I had an entire room dedicated as a pantry! I do have the closet under the stairs, but this is so much nicer. I love your organization also. It was at the top of my wish list for the new house! I say we have a pantry...with a house built around it. Thanks for stopping by! 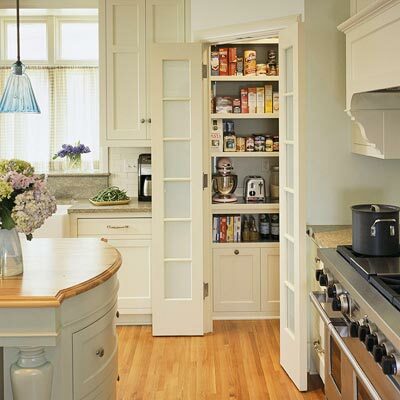 I love great looking pantries! Followed your link here from Dibble Dabbles. Only one thing - I think if you're going to take out food from their original packaging and place them into plastic containers, you should really think about getting food-grade plastic storage or even glass. I think those particular storage totes are intended for non-food storage! Thanks. This post is a few years old. We have been slowly transitioning to glass containers, but at $8 a container, it's been a slow process. I've started with the items that take longer to go through, but most items are rotated every 6 weeks or so. I've very sensitive to plastic smells, and these are not noticeable to me, but you're right that they are not optimal for food storage even though they are the perfect size for stacking! Thank you for this very interesting post. 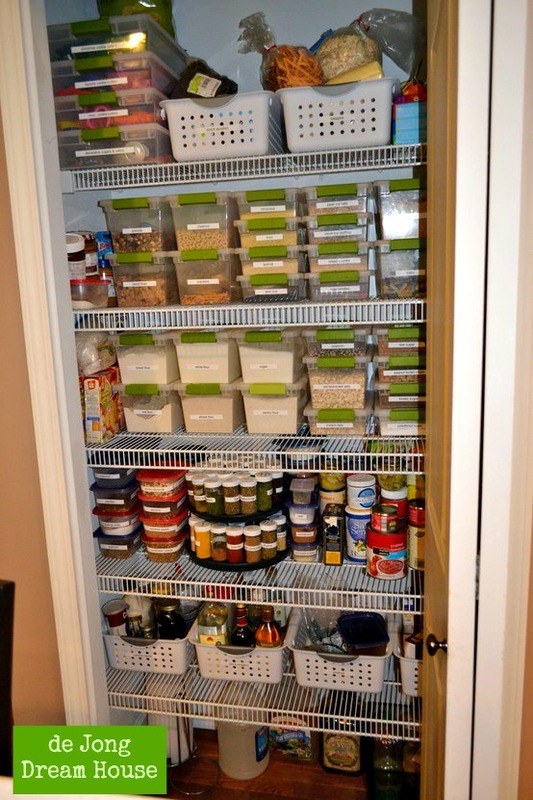 I have to say that your pantry is absolutely stunning and very organized, similar to closets Bergen. Those Sterlite clip boxes are so useful and very convenient. I also love your inspiration pantry but as I have said, yours is already stunning. Please keep on posting. Jen, Your home is so beautiful! 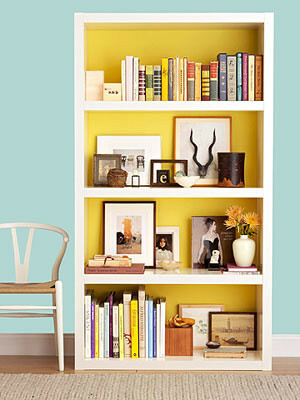 I love all the space you have and the organization makes me swoon.! Thanks for sharing at Throwback Thursday. Wow Jen everything is just gorgeous! 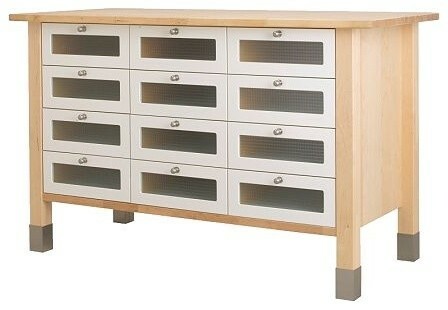 I love the Varde Counter Storage unit with all the drawers. Do you own this unit? If so may I ask you if you can measure the drawers for me or one of them if that is ok. Also the side panels which will help me decide on the height. I know that this unit is discontinued but I have the butcher block top and will try to make one. I am disappointed that Ikea discontinued these units. They were gorgeous!